Both proteins and Kevlar have long chain molecules that are strung together by amide bonds. These powerful chemical bonds are also common to several other molecules that naturally occur and even to man-made plastics and pharmaceuticals. Amide bonds are capable of providing great strength to plastics, but when it comes to their recycling at a later point, the complexity of breaking these bonds generally prevents recovery of useful products. In chemistry, catalysts are normally used to speed up reactions, but breaking the varieties of amide bonds in plastics, like nylon, and various other materials needs huge amounts of energy and harsh conditions. A research team at Nagoya University, building on their earlier work, recently produced a series of organometallic ruthenium catalysts in order to break down even the toughest amide bonds in an efficient manner under mild conditions. Our previous catalysts could hydrogenate most amide bonds, but the reactions needed a long time at high temperature and high pressure. 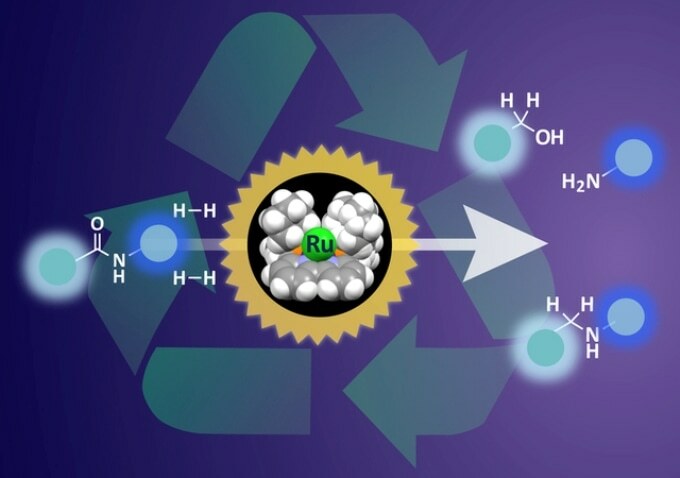 This new ruthenium catalyst can hydrogenate difficult substrates under much milder conditions. Hydrogenation is considered to be the vital step that leads to breakdown of amide bonds. A ruthenium atom supported in an organic framework is featured by the catalyst. This ruthenium atom is capable of adsorbing hydrogen and delivering it to the amide bond in order to commence the breakdown. The researchers probed the position of hydrogen on the catalyst in the reaction pathway and then altered the shape of the supporting framework. They achieved much more effective hydrogenation after ensuring that hydrogen molecule was in the best possible position for interaction with amide bonds. The changes we made to the catalyst allowed some tricky amide bonds to be selectively cleaved for the first time. This catalyst has great potential for making designer peptides for pharmaceutics and could also be used to recover materials from waste plastics to help realize an anthropogenic chemical carbon cycle.